From the moment we met Maurice, we knew that we found the perfect venue for Shelby's wedding. Not only is the venue magnificent and immaculate, but Maurice puts his heart and soul into every inch of this magical place as if it belongs to him. Miami Botanic Garden is a tropical paradise in the midst of a busy Miami Beach. Your guests will not stop talking about the birds and the butterflies that live together in this wonderland. Maurice would respond to us immediately when we had a question and always made us feel welcome. Thank you, Maurice and team, for a magical day! It was better than we anticipated. The garden was breathtaking. Maurice made everyone feel right at home and even walked my mom out to her car, he is a delight! h what a venue and what a venue manager. I thought of writing this long review but all I can say is if your considering it, DO IT!!!!!!!!!! The venue is amazing everything in one place; venue, bridal suit, ceremony space, pictures, lighting etc. The venue manager Maurice is a god send; amazing amazing amazing amazing amazing!!!!!!!!! He does what he can to help like offer you odds and ends that you’d be charged for elsewhere. The venue offers circle tables, banquet tables, chairs, cocktail tables , mic stand, plants to move around and accent spaces, some lighting, etc. He goes above and beyond!!! He also recommend our wonderful caterer and lighting guy to us!!! So beautiful and definitely worth the price. I would totally recommend the venue, and Maurice. Everything about MBBG was absolutely perfect for our wedding. The gardens are immaculately taken care of. During our January wedding, butterflies were everywhere, everything was lush and in bloom. We knew from the moment we walked the venue and met Maurice months ago, that this was the one. First, let me just say that Maurice is a hero. His genuine enthusiasm for our wedding made planning so much fun. He offered helpful tips and ideas and was there from the moment we arrived until the very end to supervise cleanup. We loved meeting with him whenever we were in town and wanted to visit. He was very clear about all of the required insurance, paperwork, costs etc. He is quite simply the best. We took advantage of the entire gardens the day of the wedding. We did our first look at the red bridge (so gorgeous), our ceremony on the great lawn, our cocktail hour on the patio and our reception in the banyon area + room. This set up was absolutely perfect. We also used the butterfly room the entire day.. Our makeup artist and lunch were delivered right there. We continued to use the room throughout the night to bustle my dress, eat some food, touch up makeup, etc. Maurice kept it locked so all of our stuff was safe, but he was there whenever we needed it opened. MBBG is right in the heart of Miami Beach which was ideal since most of our guests were from out of town (we're from New York). We were able to ride-share everywhere. There are a ton of hotels nearby and of course, the beach! If you're looking to have a garden wedding in Miami Beach, you're done looking. You found it at MBBG. 11 out of 10. From beginning to end Maurice worked with us every step of the way. Being out of state was challenging but we were so happy to have chosen this venue for our wedding. The garden is gorgeous and fits every season’s wedding. Ours was Game of Thrones themed and the venue did not disappoint! The bridal party was able to get ready on site in the butterfly room which was convenient. The only regret I have is that when the time our contract ended came (11:00pm) our guests were essentially kicked out. I would have rather been charged for the extra hour after the fact than to disrupt the reception! Other than that we were pleased. We couldn't have choose a better venue for our wedding! Maurice was exceptional and was very attentive from the day we booked the venue till the very end of the night of our wedding day. My husband and I are very happy with how everything turned out! Thank you for helping make our wedding a dream come true! Botanical Garden in south beach will always hold a special place in my heart. My husband and I got married this past October and everything was PERFECT! Maurice was amazing to work with he was so easy going and truly went the extra mile to ensure everything was all I could have ever dreamed it would be. We were allowed to decorate the Garden exactly how we wanted (lighting the candles and placing our cake on display). I was so sad the night was over! Even though our event started later then planned , the grounds are so naturally beautiful that our photos truly came out so unique and beautiful! 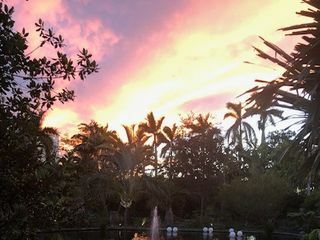 Highly recommend Botanical Garden in South beach for any future events, can’t wait to go back someday! Beautiful venue with the best staff! The decision to have our wedding at the Miami Beach Botanical Garden was the best decision we made. Not only is the garden a gem, the staff really made sure that our day went on without a hitch. I can't say enough good things about Maurice, the garden's coordinator, and how helpful he was in the months, weeks, and days leading up to our big day. The garden offers a variety of packages depending on your needs. We opted to rent the entire venue. It was great that our guests didn't have to move from one place to the next. Highly recommend! Planning our wedding became easier when we discovered Miami Botanical Garden via the internet. Making that call and getting connected with Mr. Maurice Jackson was awesome, he asked the pertinent questions and gave the appropriate answers to our inquiries. His suggestion as to which garden base on the number of guests was extremely helpful. As to available dates that we were given made our selected date more time sensitive because it’s a busy garden with beautiful wedding ceremonies during the week. Courteous, interactive, professional, punctual, always ready to assist and never too busy to answer any additional inquires are the positive noticeable encounters we saw and experienced with the staff. The garden atmosphere is very beautiful and the staff’s knowledge of their work places makes it more pleasant and Intimate. Maurice Jackson was extremely helpful and went out of his way to make my daughter’s Wedding such a memorable day! 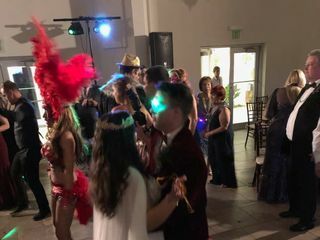 The weather was perfect and our 250+ guests had a wonderful time, enjoying the beauty of the garden during sunset and then dancing the night away in the Banyan Room! The only minor problem was the construction of the Miami Beach Convention Center which made the access through the main entrance of the garden but this should be all solved by October 2018! Thank you again Maurizio and will be returning to visit you very soon! Thank you Sandy Shapiro for all the recommendations and the fun times planning the wedding! We are very happy to have chosen Miami Beach Botanical Garden as a venue for our wedding day. We fell in love with it at first sight. Even though now there is a construction nearby, once you enter the garden, you practically don't see nor hear it. It's a small hidden gem where you truly feel like in another reality. It has different scenic places, perfect for pictures, ceremony and reception. It is very intimate and usually closed for private events, so you can fully enjoy the whole garden just for your party. We would also like to give very special thanks to the garden's manager Maurice, who has been there for us from the very beginning, but especially during the wedding day. Without his help and dedication nothing could've been possible. He worked hard to organize and decorate everything and also shared a valuable piece of advice on how to do everything perfectly. Another detail we would like to share is that the garden is fully equipped for weather emergencies. We got married in May and several weeks before and after the wedding it was raining a lot. And even though we were extremely lucky and our wedding day was unexpectedly sunny, with Maurice's help we prepared a plan B on how to do everything indoors in case we needed to hide from the rain. Again, we are very grateful to Maurice and we are happy to have selected this venue for our wedding. It was absolutely perfect and beautiful and we recommend it to everyone who wants to celebrate their special day in Miami. The Miami Beach botanical garden is truly a hidden gem. We had our wedding there on May the 18th 2018, the ceremony was a dream, with a breathtaking background. The cocktail and al fresco dinner were simply perfect. The venue is not only beautiful, but it’s also fully equipped. Our guest had everything they needed and more. Maurice is truly amazing, he went out of his way to make our day perfect. He took care of us, made us feel as relaxed as possible and didn’t mind getting his hands dirty, plus he gave us incredible and inspiring ideas. A true professional for a perfect wedding venue. The experience with the garden was AMAZING. We had such a good time in our wedding. Everything was beautiful and special. Maurice Jackson is the best, excellent customer service, and always willing to help. Maurice keeps the garden beautiful, and really adds value to the experience. This garden is the best place to get married. Beautiful garden and the staff ( Maurice) is the best!!!! Thank you for make my wedding so special. We were so grateful to find the gardens for our wedding this past March! It's a hidden gem in the heart of Miami Beach! The garden itself is beautiful (very little decor needed to make it a picture perfect wedding) and Maurice was beyond amazing! He was always quick to respond, very flexible & helped steer us in the right direction to make our special day all that and more!! The tree towards the back of the garden is nothing short of magnificent, and the uplight/string lights made for an incredibly romantic backdrop for dinner under the stars. Not to mention the CRAZY GORGEOUS GLOW that hits the ceremony space right at sunset (our post-ceremony formal shots came out amazing thanks to the shrubbery mixing in with the sunset) Extra hours were VERY reasonably priced, and we received our "incidentals" deposit back within a week of the wedding itself. Super professional and beautiful venue! <3 1,000% Recommend! We got married in February at the Miami Beach Botanical Garden and it was pure magic! When we decided to get married in Miami, we knew that the only place we would seriously consider was the MBBG. We happened upon it the previous Thanksgiving quite by accident (and I grew up there and never knew it existed) and fell in love with the beauty and charm of this little slice of bliss and heaven in the midst of South Beach insanity. From our first meeting with Maurice Jackson, we knew we were making the right decision. He was so gracious, helpful, and knowledgable and made everything so simple. 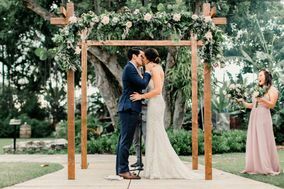 After Irma blew through, we were afraid of what the garden might look like, but Maurice kept sending us monthly updates and assured us it would be lush and beautiful by our wedding day - and it was! 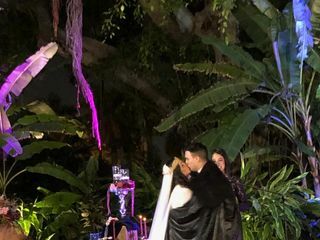 Our event started right before sunset and went through the evening so we were able to take advantage of the garden in daylight and at night when it becomes simply magical under bistro lights and candle light. The weather cooperated and our guests are able to enjoy the garden as well as the beautiful indoor Banyan Room. Maurice worked flawlessly with your vendors, some of whom he had not worked with before, and made for a truly magical and memorable night. 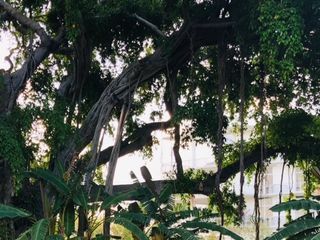 We looked at venues in both Atlanta and Miami, and the Miami Beach Botanical Garden had the best vibe out of all of them. Maurice and the rest of the team at Miami Beach Botanical Garden really increase the value of an already beautiful space. Throughout the whole planning process we were treated as family. Every visit to the garden we were welcomed by the staff and shown around. Maurice was so willing to experiment/work with us to make our wedding everything we dreamed of. After Hurricane Irma, all of the string lights were torn down by the wind. Maurice put them all back up just at our request. If you're looking for a beautiful, flexible, and dynamic wedding venue then this is the place for you! You are able to bring all of your own vendors so you can really customize your ceremony and reception, which is a feature we highly valued in a multicultural wedding. 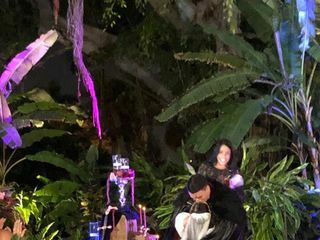 The experience gained in the recent event on February 9 at the Miami Boonical Garden was of great relevance to the ArtesanoGroup Foundation. With many wishes to repeat this experience again. Choosing the Botanical Garden as our Wedding Venue was the best we could do! The place is stunning! We got married on January and the weather was great! The service was incredible. Maurice helped us a lot during the whole process and specially during the night of our wedding. He was always there for us, he showed a lot of patience and enthusiasm. I can't explain how amazing he is! I highly recommend this Venue and specially Maurice services! We just had our dreamy wedding at the Botanical Garden!. Through the process, all the staff was so professional and kind, specially Maurice Jackson, even during the event he was there all the time taking care of every detail for us to have a special wedding. The place is magical! Our guests still talk about how fabulous the garden is. We couldn't have taken a better decision. Super recommended! Maurice is phenomenal to work with and truly made our wedding as pain free as possible. 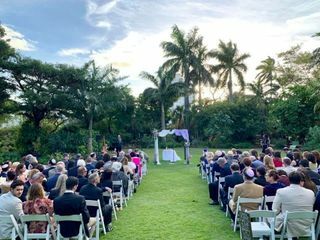 It was a joy and pleasure to work with the staff at Miami Beach Botanical Gardens, and we will always remember our special day there! The Miami Beach Botanical Garden was the absolute perfect place for our wedding, we knew it the second we walked in. Maurice went above and beyond and had so many great ideas, he is an expert about that space and making it look beautiful. No matter what style your wedding is, the MB Botanical Garden can accommodate - we would HIGHLY recommend!! Maurice, thank you for making our day extra special! You are wonderful & we couldn't have done it without you!! Working with the Botanical Gardens was perfect for our wedding reception. Maurice made the process smooth and every time I began to stress he ensured me everything would be perfect and it was. I would definitely recommend hosting your event at the Botanical Garden. Beautiful location and wonderful people.